Split is situated in the middle Dalmatian part of the Adriatic coast. According to many, this is the area with the most beautiful and most popular beaches. Ranging from modern bathing resorts with wide palette of services to hidden lagoons of untouched beauty, the Split area offers something for everyone whether you are vacationing with your friends, your family or with your significant other. The coast of the immediate city area is almost completely covered with beaches. The sea is pleasantly refreshing, clear and unpolluted, and the fragrant evergreen trees encircling the beach areas are providing most welcomed shade in the hot summer afternoons. Depending on the venue, there are countless possibilities for additional activities and services. Most of the Split beaches have accompanying cafe bars, restaurants and night clubs. Some of them have integrated playgrounds for children, sports terrains and parking lots. Many of the Split beaches are proudly bearing the Blue Flag sign; the most acclaimed international certification of ecological and touristic quality of the resort. Most of the beaches are easy to access by foot, by car, by bus and even by boat. There are several bus lines driving to and from the beach resorts in the immediate, but also in the wider city area. 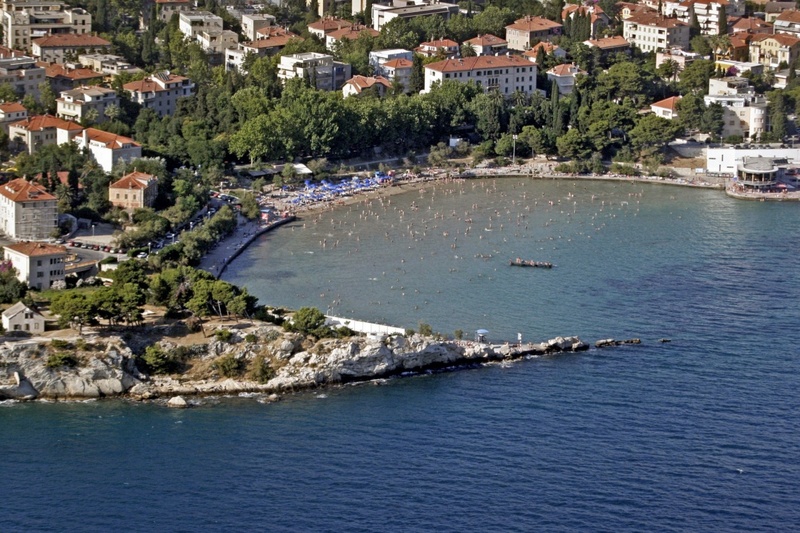 The most popular and according to many the best beach in Split is Bacvice. It is situated in the immediate proximity to the city center and the main city harbor. The Blue Flag certificate guarantees controlled water quality, excellent equipment and security with wide range of services. The beach is partly covered with sand, making it perfect for the children and for playing picigin, Split’s traditional summer sport. It is a beloved team game played in the shallow water where the players are supposed to prevent a small ball from touching the water. Some parts of this beach are covered with concrete plateaus and rocks. The beach is suitable for disabled persons and is watched over by several lifeguards. It is provided with a number of showers, deck chairs and beach umbrellas. The kids will love the nearby amusement park with the slides, trampoline and a rubber castle. There is a series of restaurants, patisseries, cafe and cocktail bars on the beach; most of them open all day long and throughout the night. Bacvice are followed by Ovcice, a lovely pebble beach with adjacent cafe bar and a children’s playground; Firule, another sandy beach surrounded by the beautiful Mediterranean trees and the exotic plants; and Pošk, a popular bathing place for senior citizens situated on a concrete plateau. Farther away from the city center there are several pebbly beaches. Trstenik is a peaceful bay surrounded with cafe bars and ice-cream stands. You can rent a deck chair, take a shower at the beach and enjoy in a wide selection of popular water sports. The beach bears a Blue Flag and is patrolled by lifeguards. Znjan is among the most popular Split beaches, not only for bathing and summer leisure, but also as a venue for various concerts. It is surrounded by several bars and a large playground for children. Below the Marjan Hill, one of the most recognizable symbols of Split and a beautiful green oasis of the city, you can find numerous beaches of breathtaking beauty. All the beaches are easy to access and surrounded by rich and thick pine forest. The most popular beach of Marjan is Bene, beautiful sandy and rocky cove proudly bearing a Blue Flag certification. Provided with restaurant, cafe bar, children’s playground and sports terrains, Bene beach is suitable for families. It is equipped with the special elevator providing an easy sea access for the disabled persons. Apart from Bene, there are numerous amazing beaches, ranging from romantic, isolated rocky coves to crowded pebbly beaches. We warmly recommend Kasjuni beach, located as the western parts of Marjan. It is a spectacular bay covered in pebbles and surrounded by the rich Mediterranean vegetation. Along with the nearby beach Kastelet, it is a popular place for daytime leisure, but also a venue for numerous dance parties and concert events in one of the numerous night clubs.